Chickens communicate with more than 24 vocalisations, each with a distinct meaning, including warning their friends about different types of predators or letting their mothers know whether they’re comfortable. 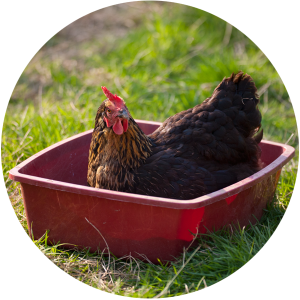 If you have your coop on wheels and a small run attached, it’s good practice to move the coop and its’ run every so often to allow your hens a nice patch of grass to scratch away at but also allows the previous patch to recover and re-grow. I have my coop in a permanent position with a large penned area (roughly 30ft square). Eventually the grass does start looking very sorry for itself due to all the scratching and droppings. In order to allow my hens access to a constant supply of luscious green grass I either cordon off a section to allow parts of the pen to recover or I let them out of the pen altogether. Chickens know to get themselves back to the coop when it begins to go dark. From time to time I sow some purslane, dandelion and clover seed to add a bit of variety for my girls. With the introduction of purslane to a chickens diet increases the amount of Omega 3 in their eggs. You need to make sure that the hens have an area of shade in the summer so they have a place to retreat to should it get too hot. However everytime we’ve experienced a hot day the hens have been sprawled out sunbathing! When I first experienced this I thought something was wrong and that perhaps they’d been injured but this wasn’t the case. They will often congregate and lie on their sides with their wings expanded and perhaps then decide to have a dustbath to cool themselves down. Hens tend to be clean birds and spend a lot of time preening themselves. They also indulge in a spot of dust bathing too and will often create their own bathing areas most likely in plant pots or in grassy areas. If they don’t have access to such spots it’s good practice to provide one which you may need to anyway in the winter when the ground is too muddy or too firm. I use a deep cat litter tray in such cases and fill it with some soil, and sand which is used for kiddies sand pits as it’s toxic free and completely safe. You can also use sawdust too. 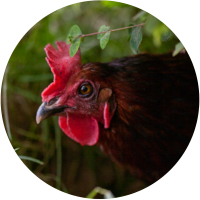 Dustbathing helps keep parasites at bay but if you do experience an outbreak of red mite, lice or fleas, you can administer treatment via the dustbath and the hens do the work for you! Dustbathing also keeps the hens cool in the warmer months. Even if it’s blowing a gale or the rains thrashing down some hens will still insist on venturing out of the coop. It’s good to have an area where they can run for shelter and small shrubs offer this protection. Be careful though that they’re not of the poisonous variety! Ground coverage is also good if they need to dash for cover if they spot a bird of prey.